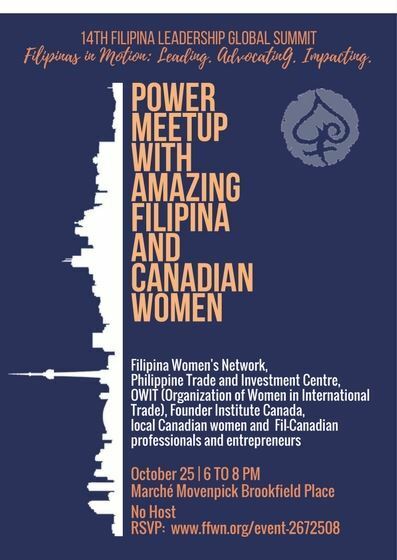 Get a head start with social networking with FWN Alliance Partners: Philippine Trade and Investment Centre in Canada, OWIT (Organization of Women in International Trade), Founder Institute Canada, local Canadian women and Fil-Canadian professionals and entrepreneurs in a Power MeetUp = Power.Discussion. Fast track your networking experience. We will form groups of 5 each for a more intimate gathering. Meet up with other local Canadian women professionals and entrepreneurs. Your group networking host will be a local Canadian professional or entrepreneur. Find out more about what they're up to. Find out what issues they care about and what life in Canada is like for career women and entrepreneurs!